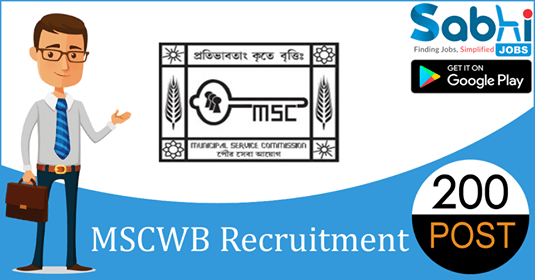 MSCWB recruitment 2018-19 notification has been released on official website www.mscwb.org for the recruitment of 200 vacancies at Municipal Service Commission of West Bengal. The candidate who is looking for Junior Assistant can apply online application from 14th August 2018 and before 12th September 2018. Qualification Pass in Higher Secondary Examination from West Bengal Council of Higher Secondary Education or its equivalent. Selection Process Selection will be based on Personality Test/Interview. How to Apply Interested and eligible candidates may apply online application form at official website www.mscwb.org from 14th August 2018 to 12th September 2018.